With all the uncertainty of Brexit it will be an interesting year for sure but CFS can help your company with security and one of the most technically knowledgable teams in the UK who can help you improve systems and cut costs., Filtration costs continue to rise and, more users of filtration are looking to CFS to avoid increases if possible and potentially save money. CFS is a UK based company with a team who can support your filtration requirements from almost any application with a wide range of customers from Pharmaceutical. Wines, Spriits, Brewing, Chemicals, Coatings, Electronics or in fact any liquid or gas which needs filtering. Whatever your requirement and whoever your supplier we are likely to offer savings, plus potential improvements in security and knowledge based on staff with over 30 years experience in the business. Filtration is a science taking years of study and experience. We dont have a sales force who have sales targets. We dont have a team who have to sell to keep jobs but what we do have is a team that cares that what you have is right and you want to stay with CFS as a partner in filtration. With the vote for "Brexit" we want to assure all our customers in Europe, and the world, that our support will not change in any way and could in fact become much easier going forward as "red tape" is removed. We see increased opportunities in many areas, and certainly not problems. With UK based production facilities in Waterlooville, Hampshire we pride ourselves on offering what is right for your application based on scientific testing to absolute efficiencies. Together Derek Baker and Sally Thompson, having over 55 years experience in filtration, are able to offer potential savings and improvements in your system or show why, based on science, your system can be improved. More and more customers are finding there is no substitute for experience and honesty, and are moving to use truly absolute rated filters from CFS. Let us look at offering the best quality in filtration, at the best prices, backed by 30 years of scientific knowledge in the industry. Graver Technologies, AMC, and the Jaguar Process range are all high quality products which can guarantee the quality of your company products and its reputation. We will not take risks and none of our staff are on commission. The customer is the most important person at all times. One phone number is all you need for all your filtration requirements and that is 0333 66 66 600. CFS is almost 12 years old and has shown growth every year. We supply and support some of the largest companies in the UK but also regard the smaller companies as key to our growth for the future. We can supply filters for any purpose and also supply them branded to our customers requirements with their name, contact details and certification. 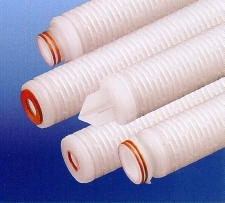 CFS, and our sister company UFS, can provide filters from the world's best known filter manufacturers. We also produce the Jaguar range here at our site in Waterlooville. If quality and exact filtration is your prime requirement please let us help you for the future. We know, based on 28 years in the business, that a filter is not just a filter. A filter which is not assembled correctly is not a filter, it's a tube and if not totally integral might as well not be there at all. We also ensure you get the right filter for your application, ensure you work to "absolute" removal ratings not nominal ratings which mean nothing, and if you need a membrane filter we ensure a membrane filter is what you get. Membrane filters also need to be validated and we supply the highest validation available. Some well known companies in the UK are now supplying what we deem "sub standard" filters to compete purely on cost. If you come to CFS we will supply quality and value for money, and hopefully the price will please you as well. Call and talk to us, and find out why so many who have talked to us stick with us. Knowledge is the key and CFS has knowledge of filtration based on working in your industry. Our knowledge covers manufacture, testing, validating and providing the right filter for every application. If you have a bacterial problem we can offer the right filter, if you have a particulate problem again we can help. One filter is not right for both. A 0.45 micron filter may not be right for removal of bacteria , we will ensure you get the right filter for the job and not the cheapest one or one that gives the supplier the best profit margin. CFS is aiming to be here for the next 20 years and we would hope we can be your filtration supplier for that time as well. Please beware of companies who just sell a pleated filter to replace a pleated filter, they are out there! Replace a 1 micron absolute rated filter for cryptosporidium protection with a nominally rated 1 micron filter and lives could be at risk. This is happening with our competitors due to lack of experience but CFS would only give the right filter guaranteed! With us there is no risk. CFS operates from 5 large warehouses in Hampshire, with large stocks and the ability to make filters to order quickly. We also have probably one of the most comprehensive test facilities in filtration, with the ability to test liquid samples to show what filtration is required for your needs. We can also test filters you currently use and give a comprehensive report on their true removal efficiency, not what is claimed on the label. 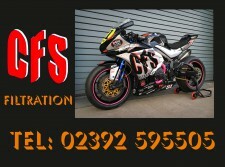 CFS was formed in 2004 and we have now, with the help of our customers, passed the 14 year "milestone" this year. Based on more than 30 years individual experience in the industry we look forward to working together with both existing and new clients in the next 10 and 20 years. Complete Filtration Solutions decided, for the 2018 season we will continue to sponsor Craig Cook who is the British Champion and support his year at the highest level in the GP circuit. Craig is born and bred British having lived in Cumbria all his life CFS has helped him trough the qualification stages to the top of the game. World Champion would be nice, but is now a real possibility. Craig will ride for Belle Vue as well. We also sponsor Kyle Newman, Adam Ellis and Dan Bewley as well as Swindon Speedway. Watch on BT sport for CFS on the front of the bikes and that is us.